Its October 27th 1979 as 25125 & 25071 face east at Leeds City. However for this pair of Type 2's their working day is done for a while. They have just brought in the LCGB Deltic Discoverer Railtour from Liverpool. Deltic 55016 will now take over the railtour, travelling over the Settle & Carlisle route, then over the GSW to Kilmarnock, and on towards Glasgow, joining the WCML near Polmadie for its return via Beattock and back over the S&C. At Leeds 25125 & 25071 were waiting for the return to Liverpool. For a larger view of the above picture click here. Three views showing approximately the same location across the years. On the left D5098 on May 18th 1963. This view is taken from Platform 12 (which would become No.15) looking generally west. To the right of the far cab is a square tower, beyond this was Holbeck shed. Just visible at the base of this tower on the right is the old LNWR viaduct that led to Geldard Junction. The Class 24 is on the No.1 goods line facing east towards Marsh Lane and Neville Hill. The center view shows the same location but now looking in an easterly direction. The locomotive is 31210 on February 18th 1988 and is parked on the old No.2 goods line. Where the Class 31 once stood is now Platform 16. Connecting the first & sceond views are the bridge girders on the left side of both views. The third view shows the present scene (2008), a lot has changed since 1963 but its good to see that the trackwork has been improved following the expansion of the station. The brick tower visible on the right side of the left and right views mark the site of a factory that made pins. The towers (two influenced by Italian styling) were used to filter steel dust from the exhaust gases emitted by the steel making process. The factory is now long gone but the unusual towers remain as listed buildings in celebration of part of Leeds heritage. Class 9F No.92133 at Leeds City on a cold day during 1963. The 9F is possibly headed for Holbeck. The two colour light signal to the left of the pole at the platform end had over the years been the location for a number of signal's passed at danger events. These signals were removed in the 1985 resignalling. Looking back to where 92133 was in the above view, is Class 47 No. 47190 with an enthusiast special heading eastwards on December 7th 1979. The steam heating is clearly working allowing the travellers some level of comfort on the railtour. Having run too many miles behind no-boilered locomotives or those with inadequate heating, it was always a pleasure to see that wisp of steam from somewhere on the train. 40121 heads east on August 7th 1982 with a Saturdays only Blackpool - Newcastle service. An unidentified Class 45/1 waits on the right for the passenger train to clear. Its late on the day of July 2nd 1985 as we stand on the Goods Road at Leeds. The HST to the left is moving off towards Neville Hill, we will follow shortly. This view is no longer possible as platform 15 now occupies this location. Leeds east, April 24 1993 on 'D' line with a westbound service. Football fans on a Newcastle - Leeds football special on August 27th 1983 needed the assistance of 45137 after 45065 had expired en-route. The special has just passed Neville Hill depot (see note below) and is nearing the end of its journey. In the above view time has not changed the scene too much, although the overhead electrification wires and masts have altered it slightly. The train is on the 'Up main' and is heading towards Leeds, having just passed Neville Hill Depot, which is just visible in the background above the two locomotives, the tower on the left is the actual depot. The sidings to the right of the photograph are Neville Hill Up Sidings, you can just about see some coaches in there, they stopped this practice about 1995 because they were used by the homeless and others who frequently set fire to the coaches! Now only freight wagons are kept here. The railway that goes off to the right now only goes to Hunslet East Oil Refinery, but at one time it would take you past the oil refinery onto Parkside Pit and would join the East Coast Main Line at Beeston Junction. Today the M621 follows much of the path of the former railway line so all evidence of it is now lost. Back to the train, it is about to go into Marsh Lane cutting, which was originally Richmond Hill Tunnel, the tunnel was filled with mirrors to transfer as much light as possible into the coaches. The far left road is the arrival road onto the depot, the next road is a shunt neck, from the depot and the next is of course the 'down main', then 'up main' and then 'up goods'. Another view fron August 27th 1983, this time 40057 is in charge of a Scarborough - Manchester working. Holbeck men used to call Neville Hill men 'Tabletop railwaymen' (or other words) because they never went up or down any hills. One example was the 03.00 Leeds - Hull mail, all it had was one van, the Deltic was booked for the morning Hull - Kings Cross passenger. But the Neville Hill men would have both engines running, a bit of overkill for the one van. A Holbeck crew would have shut down one engine to save fuel and reduce noise. Neville Hill July 2nd 1985. The west end of Neville Hill depot, with two DMU's awaiting their next turns of duty. The brick building behind the pylon controlled access to Neville Hill Depot and is known as the West End Cabin. 141014 (55524 & 55504) parked at Neville Hill sometime in 1988. This DMU set had been involved in a collision at Huddersfield station. Removed to Neville Hill, 55524 was stripped prior to cutting up, with 55504 made a spare. When the scrapman arrived to cut up 55524 they commenced on the wrong vehicle! By the time the mistake had been noticed the 'good' vehicle was no more. Neville Hill repair shed on June 7th 1987. The left road is numbered 5, descending to the right, whilst the outside road with the Class 110 BRCW on it is No.2 wallside siding. To the right of that is the East Cabin which controlled movements in the east side of the depot and the washing plants. The quiet morning air is disturbed dramatically as 43116 is fired up at Neville Hill. A week before Christmas (2007?) I had gone down to Wakefield Westgate to pick up an HST which had suffered a failure of the leading power car coming down from London. The passengers had already been transferred to another working. I relieved the London man at Wakefield so he could get the last train back to London. I'd telephoned the signalman to make sure we had a good straight run to Neville Hill sidings, on arrival here I had a quick look round the engine room. There was no water in the engine and oil had been leaking very badly from the gaskets around the turbo charger, suggesting a serious failure had occurred. Later on that night, whilst still at Neville Hill the same HST set passed me on one of the sidings, now with both power cars running, which I thought a bit odd. A short while later whilst waiting to leave the sidings I found my route blocked by the HST set, with the troublesome powercar now on fire! I left my DMU to assist the driver of the HST, he had already shut down the engine and activated the fire suppression equipment. However strong flames continued to escape from the exhaust port, presumably a build-up of oil in the turbocharger had been ignited. A sign of the times at Neville Hill on August 17th 2006 as HST power car 43083 stands cabless in the yard. The HST cabs were a separate component from the rest of the body and frame, requiring special moulds that were held at Crewe Works. It is reported that these moulds are no longer present, so those power cars sustaining accident damage to the cabs can now only be made roadworthy with a cab off another power car. On one trip I had a new guard, quite possibly his first week out as a guard, we were working a Manchester Airport - York with a Class 158 unit, we relieved the driver at Leeds and took it forward to York. This particular morning, it would have been around 1.00am, we were in the Vale of York and it got rather foggy (really it was as thick as a wood), anyway, I'm sat there with my leg propped up onto the desk, sat back chilling out doing 90 m.p.h. when the cab door opens. It was the guard, now on a 158 unit, as you walk into the cab, there in front of you is the vestibule door with a plastic window in it, so the guard walks in and looks through this window, all he can see is grey. He looks at me and says, 'Crikey where are we'? My reply 'How the heck do I know?'. My reply 'When we bump into some buffers stops, that'll stop us'. The guard turned around, slammed the cab door behind him and ran back through the train. Early in 1986 the crews of Holbeck and Neville Hill combined to essentially form one depot, which led to some chaotic times as the crews learned each others routes. The crews were everywhere, frequently working 12 - 14 hour days just to keep the trains running. If a Holbeck driver was diagrammed for a Hull job, a route which had previously not been signed for by Holbeck men, then a Neville Hill driver would be required as a conductor for the route. On odd occasions there seemed to be more crew in the cab than there were passengers on the train! There might be a driver for the traction, a driver for the route and a driver because it was his booked job. And if this was a DMU then a visit by the guard would complete the party, all that was missing was the dog! Peckfield signalbox August 1st 1988, now long since closed and demolished. In the distance is Micklefield station. In the Coal Sidings at Gascoinge Wood, June 7th 1987. We are awaiting entry on to the mainline, heading westwards towards Peckfield & Leeds. Thorpe Gates signalbox August 1st 1988 looking towards Selby & Hull, now controlling just a road crossing, but in earlier times it controlled the junction for Drax & Goole. Selby West signalbox August 1st 1988, the former locomotive depot used to lie straight ahead, at the point where the mainline curves to the right. The view entering Selby station with a service bound for Hull, August 1st 1988. With the ECML now diverted the centre roads have lost their usefulness and have been removed. A Hull - Leeds multiple unit waits for time at Selby on March 20th 1978. Selby station October 25th 1987, with the famous swingbridge about to be crossed. The route indicator is for the goods line to Little Balby. Looking eastwards at Little Balby crossing box August 1st 1988. The line merging in from the left is the loop from Selby. Up ahead used to be the junction for the ECML to York, (now a road) and a little later the junction for the line to Market Weighton. Hemingborough signalbox, August 1st 1988. To the right is the original station, the current station here was renamed Cliffe in 1998, resulting in the signalbox being demolished. Ahead lies the longest piece of straight track in the United Kingdom, eleven miles of it! Looking west towards Selby is this view of the staggered platforms at Howden station October 25th 1987. Eastrington station, looking west towards Howden, October 25th 1987. An early morning view of Gilberdyke Junction on October 25th 1987, looking westwards towards Selby. The lines to the left lead to Goole & Doncaster. The two outer roads have since been removed and the platforms made wider. Approaching Gilberdyke station on October 25th 1987. This view is looking westwards, the two outer roads are now removed. Oxmardyke, October 25th 1987, looking west towards Selby. Broomfleet, October 25th 1987 looking west towards Selby. The outer roads have since been removed and the platform faces brought closer to the mainline. Cave looking east towards Selby on October 25th 1987. the 20mph refers to the restriction for entering the goods lines at Broomfleet. Looking west towards Selby is this view of Crabley Creek on October 25th 1987. Looking towards Hull on October 25th 1987, this is Brough East signalbox. Welton box, August 1st 1988. Looking east towards Hull barely visible just left of the signal is one of the towers of the Humber Road bridge. Melton, August 1st 1988. When this photograph was taken this small station was still served by four trains a day. Now the platform on the right has been removed, the trains no longer stop here. This view is looking west towards Selby. The last signalbox before reaching Hull is seen here - Hessle Road Bob, on August 1st 1988. The Hull & Barnsley railway used to cross the line at this point using a massive iron girder bridge. Today the H&B here is gone, road traffic now taking its place. On one Leeds - Hull & return working we had reached Hull and with time to spare before the return working we shot off to the local TV shop (also known as a public house!) to watch the penalty shoot out between England & Germany. We waited for the last penalty shot to be taken before hurrying back to the station, to take out our train. We were four minutes late in getting away, the guard wasn't too happy, but nothing was said much back then. Attempts to make up the time were thwarted by many signal boxes slowing us down to notify us of the soccer result. We arrived at Leeds about twelve minutes late, oh well! Whilst out 'road learning' with the DMU one morning we were stopped at Hebden Bridge's home signal - these trips were like a big girls outing on the road learning units. The driver had left the cab of the DMU to go to the trackside phone, in his absence we put the 'spoon' (the forward/reverse lever on a DMU) into reverse. The driver returned from his phone call, waited for the signal to come off, then selected first gear, released the brakes and away we went, backwards! Further along on this trip the line traversed a number of tunnels, with everyone talking away it was easy to remove the big brake handle in the darkened cab, the action going un-noticed by the driver! That was until it came time to make a brake application, promptly turning a funny colour! Releasing the 'deadmans' handle in this case would certainly bring about the desired brake application. Today (2006) things are totally different when it comes to road learning, firstly you have to pass as a Driver before you can go road learning. When I started as a secondman (which there are none now) and I became interested straight away with the job, asking too many questions, the Drivers soon realised that you were interested and they answered your questions, say after about a year some Drivers let you 'move' the locomotives around the depot, after about another year, when you climbed onto the diesel, some Drivers would ask you 'do you know the road' well we didn't, but you said yes, and you did ask for help from the Drivers. I wouldn't have swapped it for the world, so today, we sit with the new Drivers and keep a eye on them, eventually putting them in charge while we sit at the side of them, But they are Drivers too, as we were only secondmen (not qualified to Drive). I can remember my first ever Drive as a secondman with 45 070 on the main line in 1975 (vacuum brake 9 coaches Leeds via Cudworth - Sheffield), after hooking the train on at Neville Hill, the Driver P. Pullan said, 'it's about time you had a go', I went white, but words like 'you'll be doing it shortly, because I won't be here soon' made you feel a bit special, also if you listened to the Driver, it was all experience - some secondmen never bothered and they eventually failed their exams). I did ok for a first time, but to put on paper about vacuum braking trains, well you can't explain it. 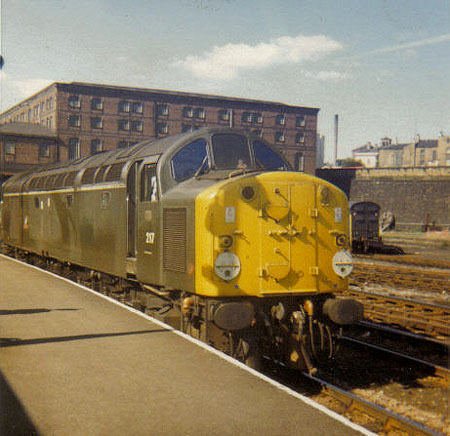 Another experience was with a Driver, Ken Gleghorne, you didn't want to go home when you was with him, he was a great mate, But this day again in 1975, we relieved a frieght train outside Holbeck Shed and worked it to Hellifield (it was a mixed freight) and you returned with a tank train, we had a 40 on the head of the train and Ken said, 'Here have a drive, I'm going to relax' so off I went with 1,500 tons on, 40's are fun to drive, you can soon overload the power on them, again vacuum braked, I explained that I had never driven a big freight train before, again came the answer 'Well you've got to learn sometime', so off we went, Ken keeping a close eye on me, we were soon into battle, on approaching Apperley Junc where the line splits for Ilkley, we had the 'distant on' so I put the brake on, well the weight of the train put the wind up me because when you put the brake in on a vacuum brake train, there is a slight delay from the brakes applying, so I put the lot in (panicked really) and we came to a right stand still (good job it was a fully fitted train, I would have killed the guard) Ken pointed out to me that in the distance, about a miles and a half away was the stop (home) signal, he said 'That he would have to get a taxi to reach the phone at the home signal to speak to the signalman', but at least I didn't pass the signal at red. He called me an unusual name and told me to calm down and get on with it, of course with a bit of coaching from him helped. For many years the Class 40's were a big part of the scene in the Leeds area - here are two views of these fine machines. The above view appears to be a namer, 217 'Carinthia' departing platform eight at Huddersfield heading for Leeds, whilst the view below is of an unidentified machine passing Holbeck, the headcode suggesting its part of an an engineers/permanent way working. 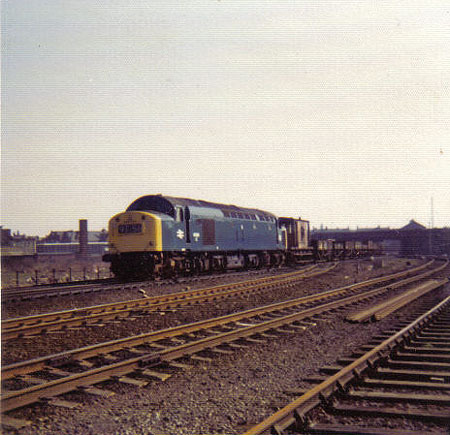 It has just passed under Nineveh Road Bridge, Holbeck depot is on the right and the Class 40 is standing at the site of Engine Shed Junction signalbox. Because of the excellent forward visibility from the leading passenger compartment of most diesel multiple units, they were an excellent choice for driver route learning specials. On August 14th 1989 whilst acting as the road learning instructor a gang of us were sent out on a road learning trip to Carlisle. However all was not well this day as the dmu scheduled for the trip was borrowed to cover a failure and the train provided to us was a dmu alright, but one converted for parcels traffic, so it had no seats and forward visibility was limited only to the cab, making it a most useless vehicle for road learning! However all was not lost, to pass the time a soccer ball was brought on board, goals were established at either end of one vehicle and a soccer game commenced, not an easy task to accomplish when speeds frequently reached 60mph! I feel this photograph needs a witty caption..............its Michael in the cab of a dmu being used on the driver route learning special referenced above, on its way back to Leeds. The unfortunate route learning dmu, led by 54300, at Carlisle on August 14th 1989. An interesting view from the cab of the dmu, including some vintage rolling stock and two ETHEL's, with 97251 being the nearest to the camera. The route learning special had been instructed to traverse the triangle south of Carlisle station. It is obvious from these pages that Michael spent a great deal of time photographing the routes that he was working over, unofficially capturing the changing scenes on those routes operated by the Holbeck crews. Eventually the still photography led to the idea of using a video camera to capture the entire journeys! For the filming a camera was hired on & off for weeks on end, costing something like �50 for two weeks and �80 for a month, so when he could, he used to hire it for a month. This gave him a lot of headaches because it was a challenge in trying to film a lot of railway routes before further changes took place to the routes involved. After about two weeks, word had got out that someone was doing a lot of filming from cabs, a couple of inspectors were sent out to capture him (me), but being one step in front, I let them chase me for about a week, in the end I had to tell them what was going on. I think this was about the time when I was approched by the manager at Leeds, asking if I was interested in being a road learning instructor, the question was greeted by a very enthusiastic yes !!!! After this I had nine years of going out & about with the lads showing them the railways of that time. Some of the drivers thought I was crazy, but twenty or so years on the still photographs & video footage is now very interesting to look at! A couple of times I went out with the Holbeck Steam Crane, it was an adventure. On one occasion when I was about nineteen we went out with the crane signing on for duty one Saturday morning at 6.00 am (I should have been spare), it was January 1977 and on entering the yard I noticed the crane getting steamed up ready for departure, after booking on I was met by my Driver K. Hogg, who told me that a class 40 had come off all wheels in the yard at Normanton and it's going to be a long day, I replied, what about the girlfriend that I'm taking out at 19.00, 'forget that' came back the reply! With the Holbeck Breakdown crane came three old coaches, one to provide all the re-railing equipment, one a mess van with a full kitchen including chef (well someone who could cook), and one with all the bits and bobs in it, then of course the brake van. The reporting number was 1Z99. At about 08.30 we departed for Normanton, the locomotive rostered for the train was a Class 45, on arrival at Normanton the signalman at Goose Hill Junction put this lot into the yard. Here we were greeted by a Class 40 buried and I mean buried into the buffer stops, it only had it's pony wheels left on the track. So the time now is about 10 ish, off to work the crew go, I stood watching. At 12 noon the shed master came on site and began a meeting, over the road in the pub (nice) after a couple of hours and pints later, we returned. Well times marching on and it's 17.00, yep back for another meeting in the pub, this time I rang to tell the girlfriend that it was going to be a long job !! At 19.00, we were back on the scene, by this time the crew had placed wood all along the wheels of the Class 40. Then my driver climbed onto the Class 40, started it up and let rip, the locomotive creeked it's way back onto the rails eventually, with all wheels on, the fitters checked that all was OK to run (coupled to us) back to the shed, arrival on Holbeck 22.30, wow what a day. Getting back home, my dad asked where I'd been, so told him the story, 'can you get me a job' came the response. Sometime in January 1977 we booked on at Holbeck at 08.00 with the steam crane hauled by 45002, arriving at Adwick Junction (near Doncaster) about 10.50, running round our crane and train, departing here at 11.10, arriving thirty minutes later at Hemsworth Loop to find an overheated 31 409. Afte the Class 31 had cooled down, we coupled everything together and departure was at 12.30, making a run to Calder Bridge Junction leaving the East Coast Main Line at Hare Park Junction, after arrival there, we cooled down the Class 31 again, which took another hour, then a swift run to Normanton, (down the goods loop at Goose Hill Junction). Whilst waiting here my driver asked me what the heck was this approaching, it was a western hydraulic, the one that had been to Leeds that day (oh how I wish I had a camera back then) - a Western at Normanton!! We left Normanton at 17.00 to arrive at Holbeck at 19.15, what a day that was. Driver Ronnie Longbottom told me, when it turned up at Derby his eyes nearly popped out, the manager/foreman at Derby asked him 'if he knew the traction', 'No' was the reply, at Derby and Sheffield they tried to replace the Western, but both had no replacement available, so Ronnie conductored the Gloucester man all the way to Leeds, here it went to Neville Hill for fuel, with the Gloucester man politely advising the fitters where to put the fuel! Once fuelled it went back with a Leeds - Plymouth working. A mate of mine raced home on a motorbike for his camera, (He lived at Batley) only to return to find out that he had missed it by ten minutes, - if he had raced to Normanton, he might have caught it in time (we'll never know). Another day out with the steam crane, took me to Hemsworth, just south of Wakefield where a class 45 had been stopped with an overheated roller bearing. First, why we took the steam crane, I don't know! It was snowing this day, the cab was warm and the tea flowing, too much tea really, but it all came in handy later! So we arrive, look at the scene, tell the signalman we are ready and make a run for it to the next goods line, all going at ten mph. Off at Hare Park and into Calder Bridge goods loops (near Wakefield Kirkgate). Well, the Class 45 was steaming, I was bursting for a wee, my driver told me to hold it back for another minute, on arrival, the Class 45 was checked, the processed tea now finding a home onto the offending roller bearing, then it was the fitters turns, then the snow. Another run still at ten mph led us to the goods line at Goose Hill Junction, and after stopping again, it was every man for himself! Voluminous amounts of snow were also used to cool the bearings, we eventually arrived at Holbeck, another job done. A rescue job in reverse! A Class 45 is sent for wheel turning. Gordon replied, these happy fellows at Doncaster have found out there is a locomotive going to Stratford and they are going to take it off us, my heart sank! True as he said it, a Doncaster crew came over the rails towards us. Now I've mentioned Gordon before, he's about 6ft round and wide and built in a 25 stone frame, hands like spades and a mouth like a hair drier, so I was ready for this........ The cab door opened and this Doncaster man put his head in the cab, 'All right lads, we are taking it to Stratford', Gordon filled his lungs and into battle he went, the language was disgusting, after what seemed for hours Gordon turned to me, 'Alright Dan, go get on the phone and tell the signalman, Light Locomotive to Stratford', the Doncaster men were last seen heading back to the depot and so off we went. Of course the Doncaster men were after the job, because of the mileage bonus involved. In all his years of railway service Michael never received the opportunity to drive the Royal Train. But he did come close, instead being responsible for driving the back-up locomotive to the Royal Train between Doncaster and Leeds sometime in the mid-1980's. Notification of the working was received the day before, along with the instruction to get my hair cut. I was to travel passenger to Doncaster and there relieve the crew from the incoming back-up locomotive. We would then follow the Royal Train to Leeds (where the Queen went shopping?) and return our locomotive to Holbeck. So we go passenger to Doncaster, after getting off the train I find there's a guy in a very nice suit staring at me. Eventually he comes over and asks if I'm Driver Kaye from Holbeck, so I ask him who exactly he is and the conversation goes down hill from here. He took me aside and wanted to know where I'd been because the police were combing Doncaster station looking for me! His instructions had been that I would arrive jointly with Driver Banks, who had shown up alone, so I was presumed missing in action somewhere. I showed the suit guy my working papers, which supported the time of my arrival and he calmed down, but offered no apology. When the locomotive arrived we all climbed in the cab; me, the suit guy and two bodyguards of some sort, in the back cab was another happy assortment of men. So we take off for Leeds and eventually end up at Holbeck depot on No.10 middle road, where we were in full view of everyone at the depot. I get out of my seat, grab my bag with the intention of visiting the messroom for some lunch. But Mr Suit tells me I can't leave for security reasons, if I want lunch it'll have to be taken in the cab. So now its time for a visit to the toilet for a sit down job, not possible says Mr Suit, security reasons of course. After a little persuasion the toilet trip was made under close supervision of my shadow, Mr Suit. We return to the locomotive and leave Holbeck to shadow the Royal Train to Bradford Interchange, Halifax & Huddersfield. Here I was relieved by another crew and returned to Holbeck. The date is not known but here is a very clean looking 47461 with the Royal Train standing at platform 5 at Leeds. A story told one day in the Holbeck messroom also referred to a Royal Train working back in August 1977. The locomotive had come on to Holbeck shed but no-one was allowed near it. Later serious problems were encountered at Bradford Interchange as the train was drawn up perfectly to the correct position for the red carpet. Heavy rain was now falling and the guttering above the location of the red carpet was failing badly, sending water all over the place. The Royal party had to be briefly detained whilst the train drew up a little further to avoid the roof with the leaky guttering. D5098 or D5099 leaving Harrogate on 'The Stray' approaching a curve beyond which is now a new station called Hornbeam Park. 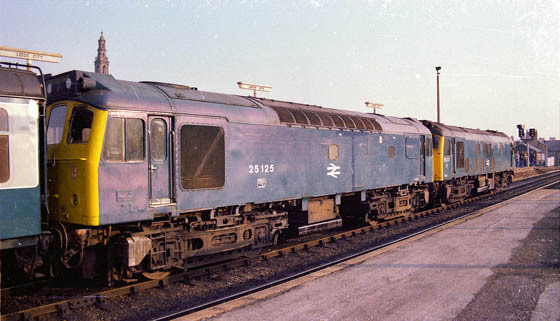 The everyday working of named or Pullman trains by the Class 24's was not a frequent event.